When it comes to favourite cut of beef, Caroona graziers Derek and Kirrily Blomfield, have a few. But it’s not the premium cuts that get their tastebuds going. Instead the pair who launched their branded beef business The Conscious Farmer earlier this year, it was the cuts destined for hours of slow cooking that was top of their pick. 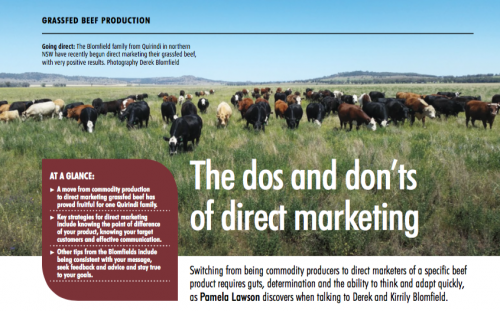 Switching from being commodity producers to direct marketers of a specific beef products takes guts, determination and the ability to think and adopt quickly, as Pamela Lawson discovers When talking to Derek and Kirrily Blomfield. Over the past nine years Quirindi farmers Derek and Kirrily Blomfield have found themselves being forced to consider their farmer future. As third generation beef commodity producers on the black soil of Liverpool Plains of northern NSW. 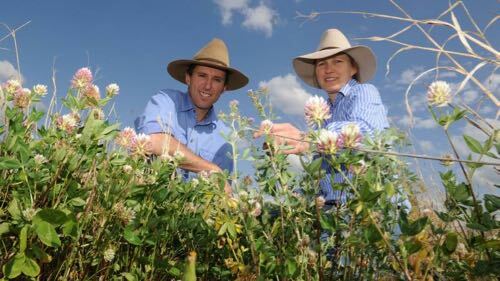 Derek and Kirrily Blomfield operate “Colorado”, a 980-hectare beef cattle grazing farm on the Liverpool Plains. The Blomfields produce steers and heifers grass-fed on perennial pastures, and processed and sold direct to consumers. Derek and Kirilly Blomfield see the best in things. They live their lives consciously and love what they do. After a long road and some hard knocks, they established The Conscious Farmer and, with it, their farming path and way of life. Their good life. 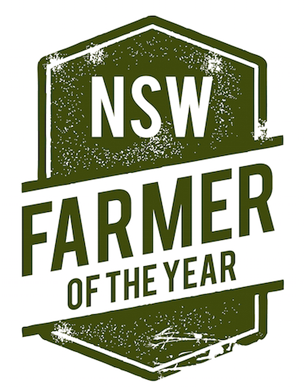 QUIRINDI graziers Derek and Kirrily Blomfield have been named the 2014 NSW Farmers of the Year. The couple manage “Colorado”, a 980-hectare beef cattle grazing farm on the Liverpool Plains, where they run 500 head of cattle and practice rotational grazing. They market their grass-fed beef direct to the consumer under their brand The Conscious Farmer, and also engage with their customers through a subscription-only blog which discusses regenerative agricultural practices and their practical application for both broadacre and small scale farming and grazing. This is an ABC radio interview with Derek and Kirrily’s, 9 year old son Reilly. The interview discusses what we do and Reilly’s insights into living on a farm and looking after animals. This is an ABC radio interview with Derek Blomfield, explaining why they produce the way that they do and what that means for the beef and our customers.